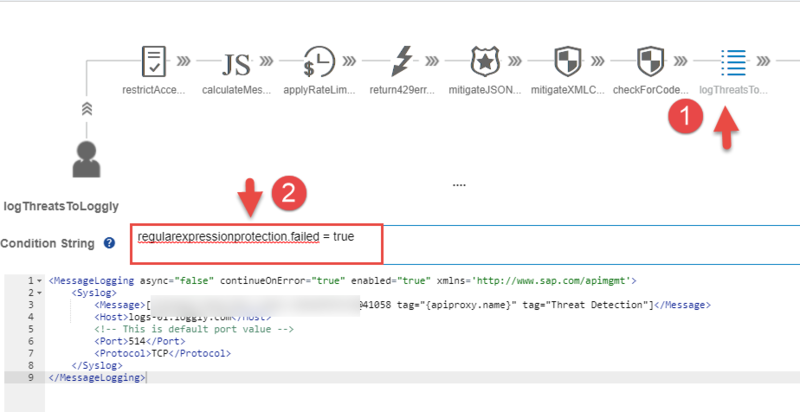 In the blog series Threat Protection against SQL Injection attacks and XML External Entity injection attacks, we have described the usage of Regular Expression Protection security policy from SAP Cloud Platform API Management to protect the API against commonly occurring cloud threats. 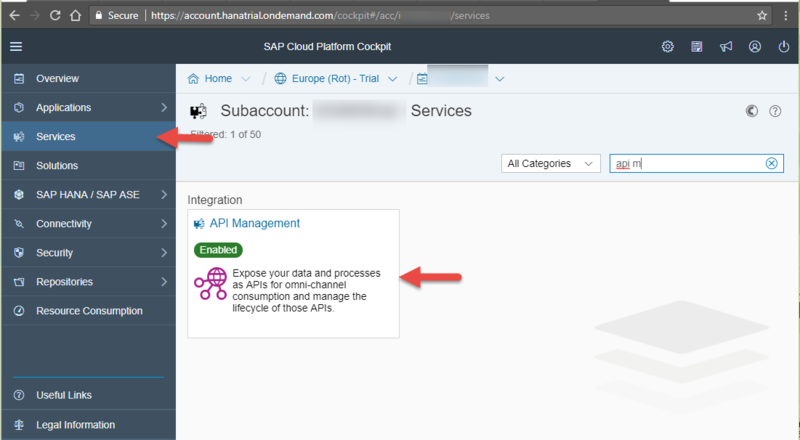 In the blog Log all API interactions, we have described the usage of Message Logging Policy from SAP Cloud Platform to log API interactions into a Third party logging server like Loggly. In this blog, we would cover the scenario of raising alerts whenever a code injection threat (SQL Threat/ XXE attack) is detected. 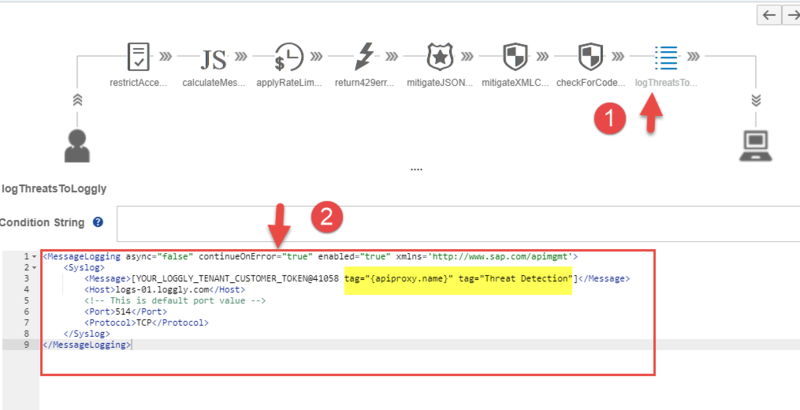 This scenario can be easily modeled using the Message Logging Policy from SAP Cloud Platform API Management to log any security threats detected into a Loggly tenant and then using the raise alerts features from Loggly to send email notifications, whenever an cloud threat is detected. In the blog we have used Loggly as the Third Party Logging server, alternatively other logging server like Splunk could be used. Sign in to your Loggly tenant. Navigate to the Source Setup and then click on the tab Customer Tokens to fetch your Loggly token. This token would have to be used in the Message Logging Policy later in the section Log Regular Protection Threats. Navigate to the Services tab, search for API Management service tile and click to open API Management service. In this blog, we would be extending the Regular Expression Protection Policy used in XXE Threat Protection blog. Navigate to the Define from the hamburger icon, then select the tab APIs. Select the API Proxy to which API Rate limiting was applied. 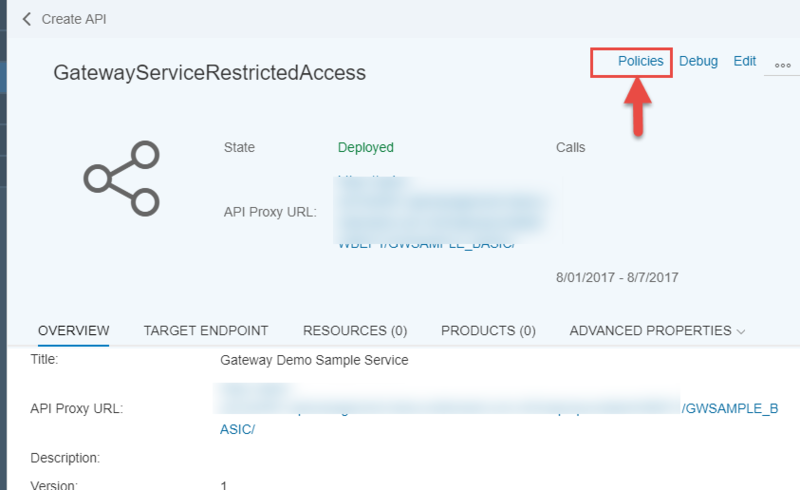 Click on the Policies button of the selected API Proxy. 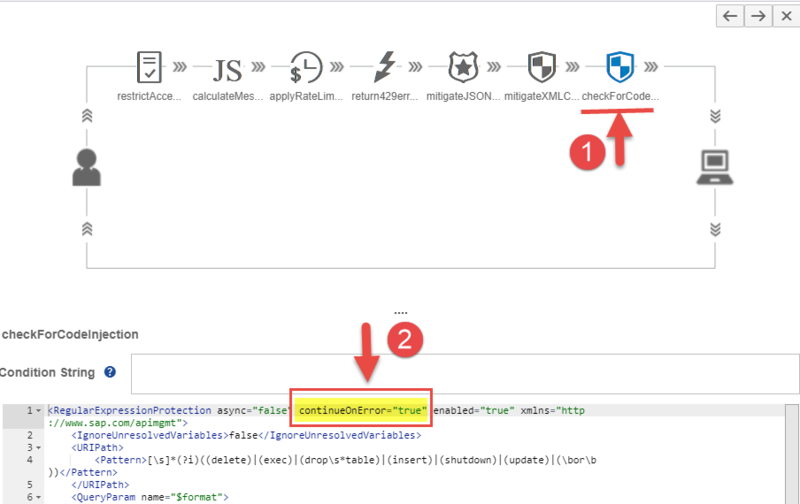 Select PreFlow from the ProxyEndPoint and select checkForCodeInjection policy, then update the policy by setting the continueOnError flag to true. 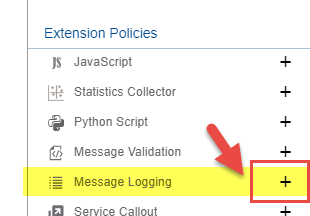 Click on the + button next to the Message Logging Policy available under the Extensions Policies segment to log the generated log message to a Third Party logging server. 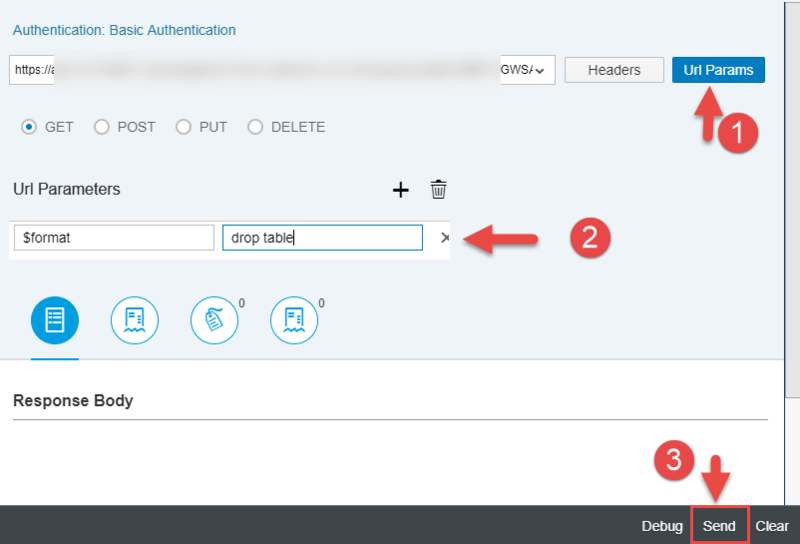 In the Create policy screen specify the policy name say logThreatsToLoggly and then click on the Add button. 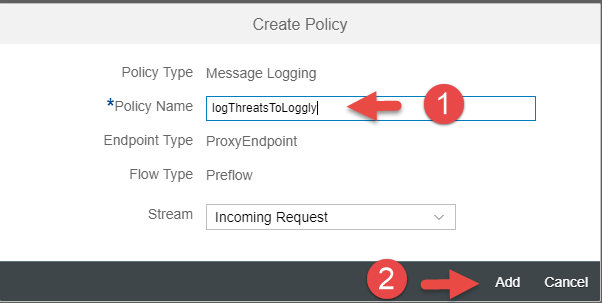 Select the policy newly added logThreatsToLoggly policy then add the following policy snippet to log the generated log data into a Loggly tenant. In this blog, we have used Loggly as the third party logging server, alternatively any other logging server like Splunk can also be used. 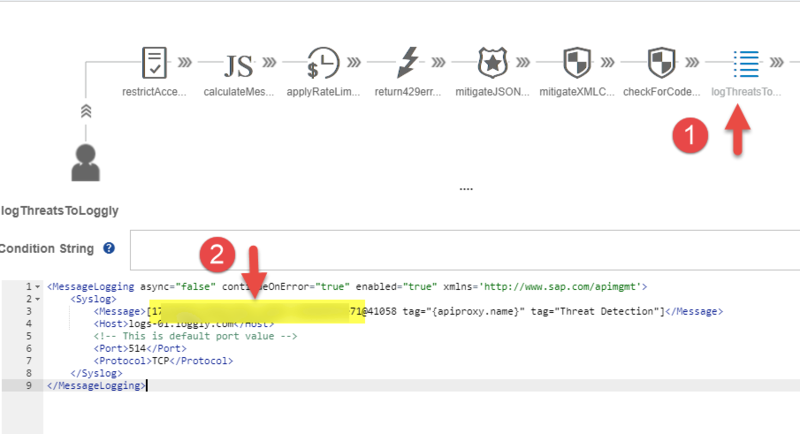 The above snippet would log the api proxy name for which the threat was detected and also add tag Threat Detection to the log message. 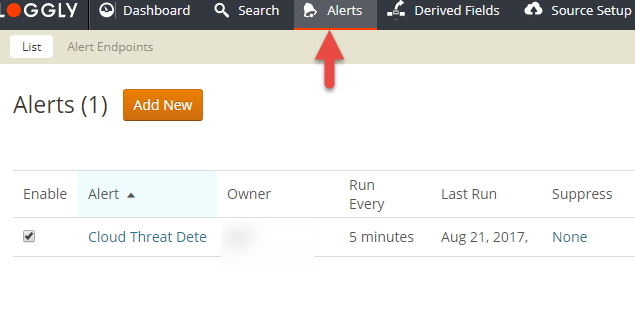 This tag would be used to create custom alerts on Loggly server in section Configuring Alerts on Loggly Server. Edit the policy snippet added to post log message to Loggly server to use your customer token configured in the Loggly tenant as explained in section Customer Token from Loggly tenant by replacing the text YOUR_LOGGLY_TENANT_CUSTOMER_TOKEN (highlighted in previous screenshot) with your Loggly customer token. 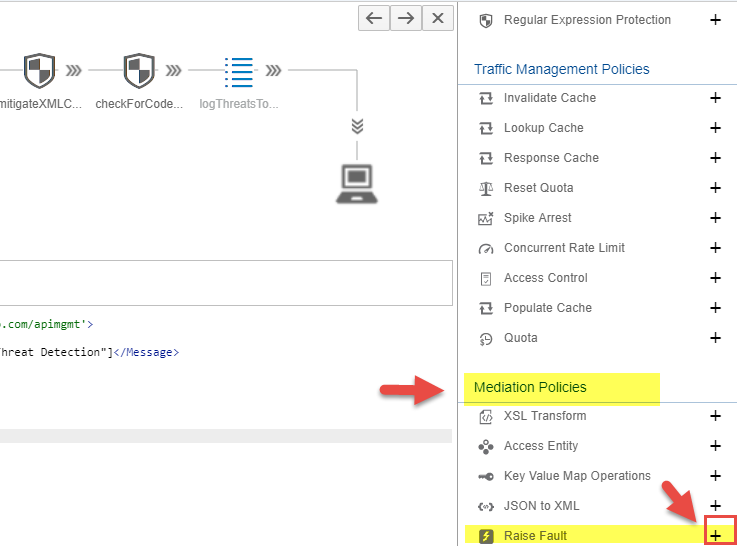 Click on the + button next to the Raise Fault Policy available under the Mediation Policies segment. 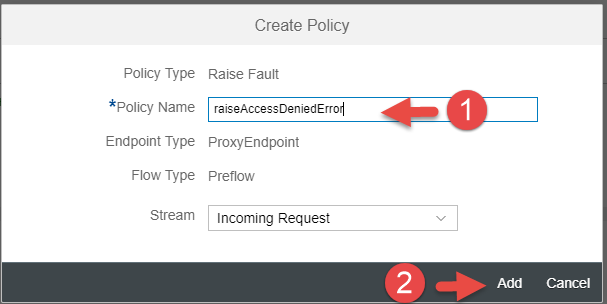 In the Create policy screen specify the policy name say raiseAccessDeniedError and then click on the Add button. 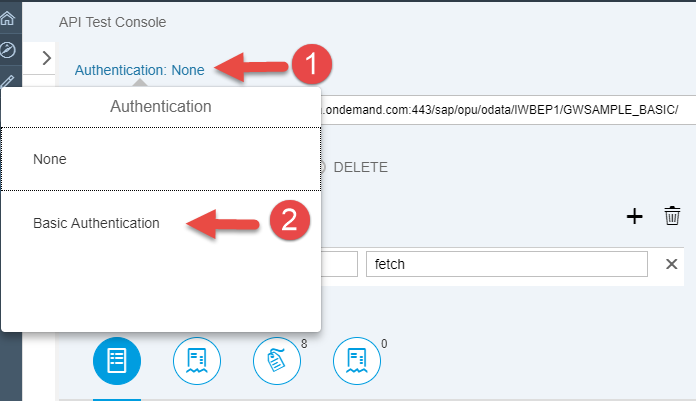 Select the newly created raiseAccessDeniedError policy and add the following policy snippet to return the error with status code 403 and Access denied error. RaiseFault Policy allows to return custom error message to the client. The above policy snippet would return the error response with the HTTP status set to 403 and the reason phrase is set to Access denied. 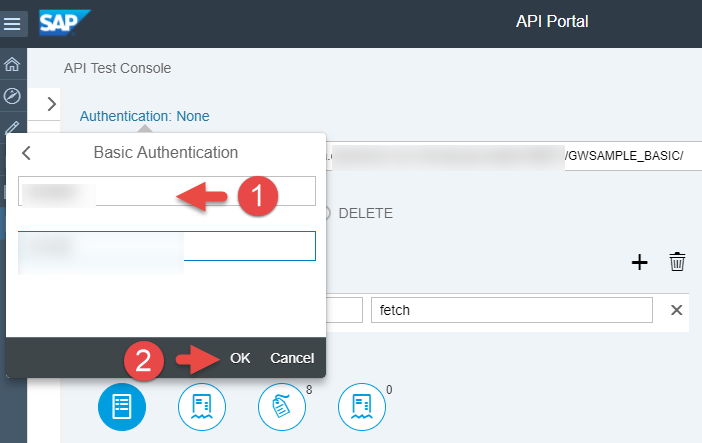 Click on the Save button to save the changes to API Proxy. With this we have successfully applied a Message Logging Policy to log the threats detected via Regular Threat detection to a Third Party logging server like Loggly and raise 403 access denied error. 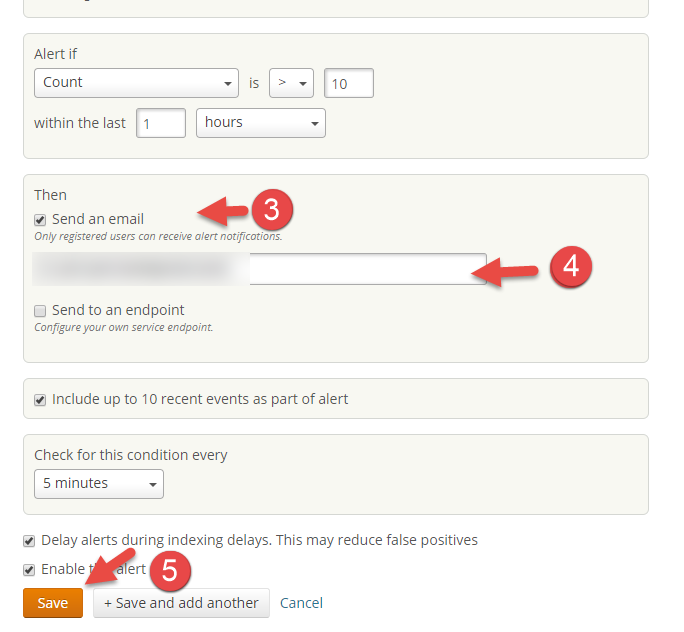 In this section we would cover the steps to configure alerts on the Loggly server. Click on the Favorites ( * icons) to save the search field as custom search field and then select the option Save this search as. 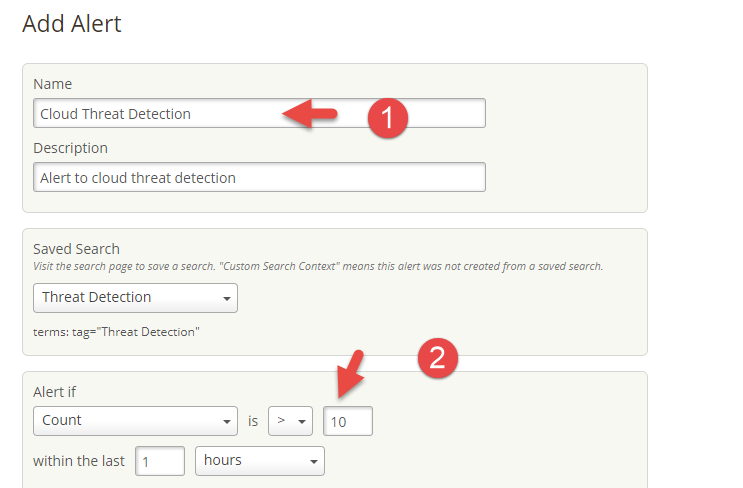 In Create Saved Search dialog, enter the name of custom search say Threat Detection and then select option Save then create alert. 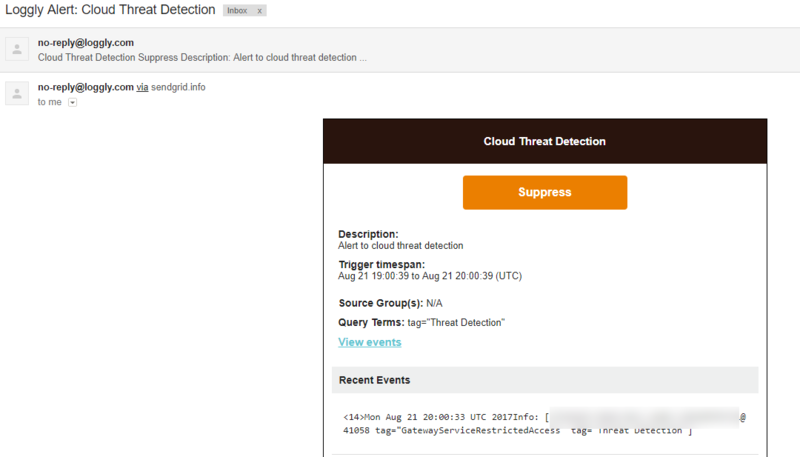 In the Add Alert dialog, enter the name and description of the alert say Cloud Threat Detection, specify the alert conditions, enter the email address to which the alert email notifications should be sent and then click on the Save button. With this we have successfully created an Alert in Loggly tenant to send email notification whenever more than 10 log messages with tags Threat Detection is received in a given window of 1 hour. 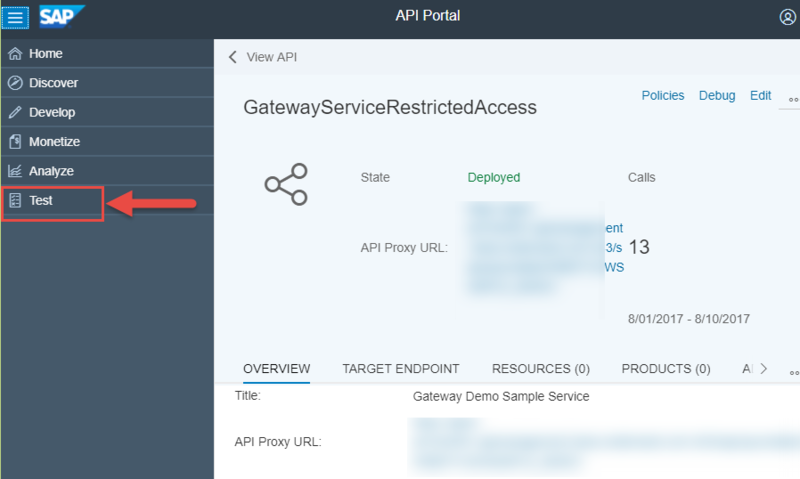 From the APIs list search for the API Proxy that you would like to test say GatewayServiceRestrictedAccess and then click the API to test. 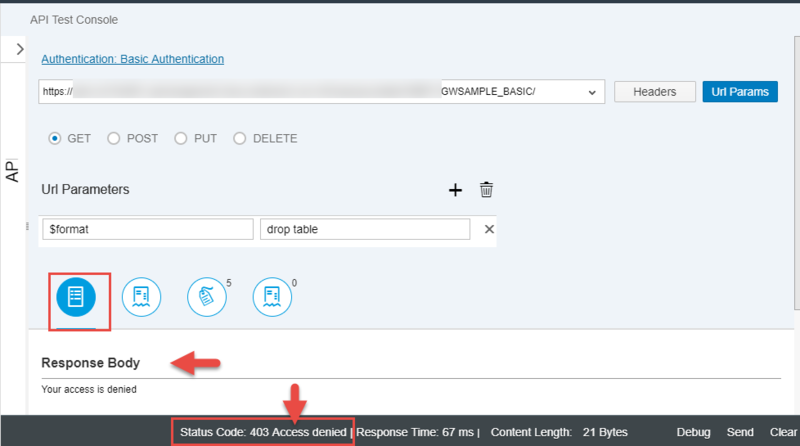 Since a SQL command drop table was passed in the query parameter, it would be detected by the Regular Expression Protection Policy and then an error would be returned. Click on the send button multiple times (more than 10 times) so that alert is raised and an email notification is sent to your configured email address.